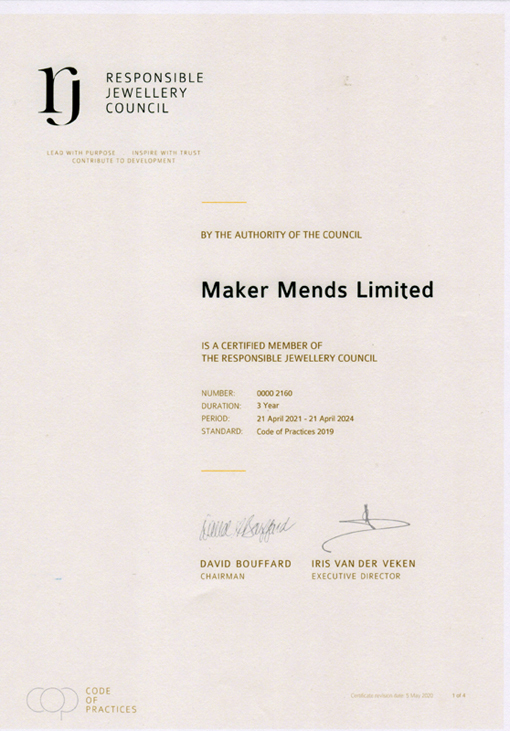 Maker Mends Ltd Granted Responsible Jewellery Council Accreditation. The Responsible Jewellery Council has Certified Maker Mends Ltd for its facilities in the UK and in Thailand for compliance with their code of practices. David Lewis the Managing Director of Maker Mends Ltd said " It has been a very exacting process" and recognises the exceptional efforts of Kathy Stevens in the UK and Umarin Pantong in Thailand who oversaw the operation to ensure all standards were reached. He also acknowledges achieving the three year certification was made possible because of the full commitment from all employees in both locations. Working from two countries with completely different laws has meant achieving the RJC Certification was complex and challenging requiring in total three visits by the auditors to pass their stringent requirements. Despite Maker Mends Ltd being a relatively small company, in comparison to other RJC members, David felt they should lead the way for other similar businesses. Improving both their commitment to sourcing stones and metals responsibly all along the supply chain and the working conditions of their staff. David believes that the most important element of gaining Certification is that the staff at Maker Mends Ltd know that their welfare is of the utmost concern and that our customers know that we run a business that is managed with a commitment to social and ethical policies. Maker Mends Ltd in the UK is the leading service provider for retail jewellers for all aspects of the trade from general jewellery and watch repairs as well as engraving. The workshop in Thailand produces beautiful hand made items for clients from all over the world. The Responsible Jewellery Council is an international not-for-profit standards and certification organisation. It has more than 600 Member companies that span the jewellery supply chain from mine to retail. RJC Members commit to and are independently audited against the RJC Code of Practices – an international standard on responsible business practices for diamonds, gold and platinum group metals. The Code of Practices addresses human rights, labour rights, environmental impact, mining practices, product disclosure and many more important topics in the jewellery supply chain. RJC also works with multi-stakeholder initiatives on responsible sourcing and supply chain due diligence. The RJC's Chain-of-Custody Certification for precious metals supports these initiatives and can be used as a tool to deliver broader Member and stakeholder benefit.